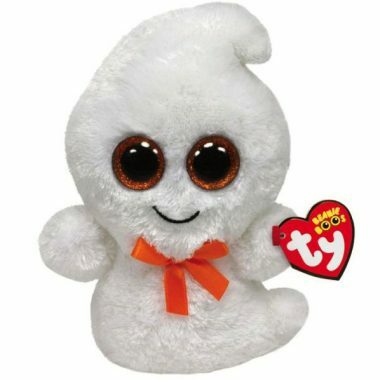 Ghosty is made from a fuzzy, white material with large sparkly orange and black button eyes and a black embroidered smile. He wears a small orange ribbon around his neck. From room to room is where I roam! Ghosty was reintroduced in August 2013. His birthday is now on 29th October. The original release was on 31st October. This is the second release of Ghosty. The 2010 version didn’t have glitter eyes. Ghosty is a Halloween themed Beanie Boo.